Please ignore the wrinkles as this dress is still not sewn together! 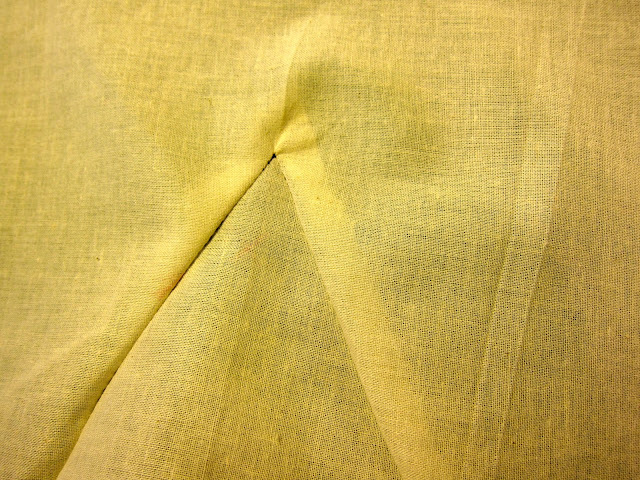 I had a hard time sewing, ripping and sewing again the two main corners. Here's the corner technique which Susan Khalje showed me. Especially if you do it for the first time, mark the corners (symbolically) as pieces X and V due to the shapes they create. Do the same with the piece V. Be very careful at the top to make the needle pivot at the very center. After you have staystitched piece V, cut into the fabric as close to the stitching as possible. Don't worry, it won't unravel! Pin both pieces right sides together starting from the corner. 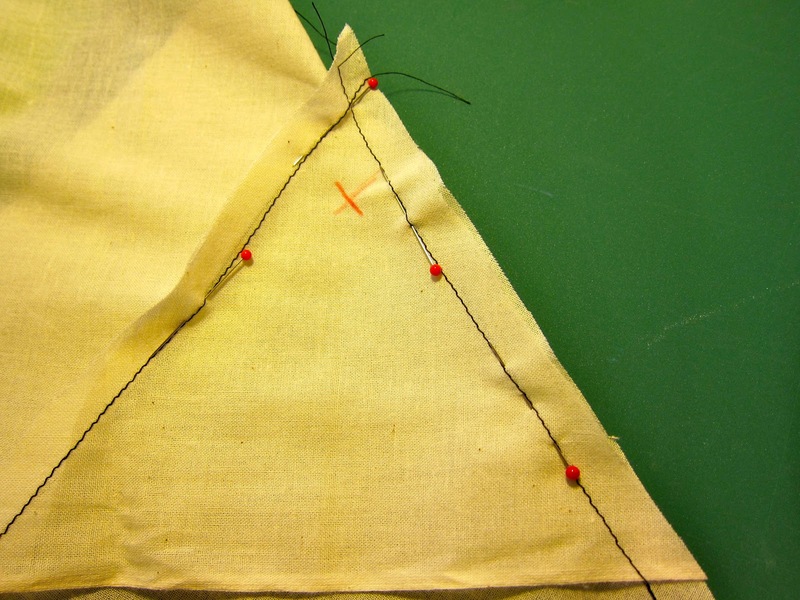 Because you will pivot at the corner, pin your fabric so that it will be easy for you to remove the pins as you sew. See how the pin heads are placed? 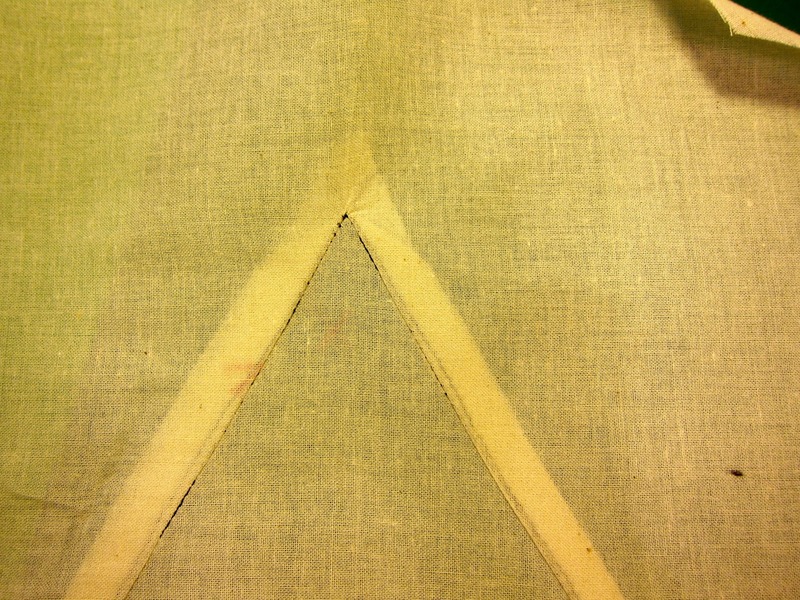 I start from the bottom left towards the corner, then pivot and go down all the way along the right seam. Here you go, your corner looks perfect (almost)! Never underestimate the importance of pressing! Muslin is an easy-to-handle fabric. Cotton or linen would behave nicely as well. During the couture sewing class, I had my share of trying to handle the corners on two layers of silks: silk satin and crepe-de-chine. It did not go smoothly in the beginning and it took me a while before I could sew some corners of my dress with a bit of confidence. 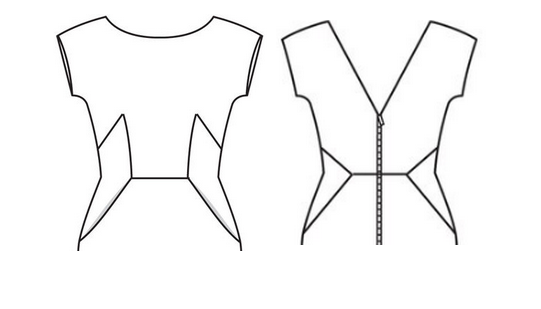 Have you ever come across difficulties in sewing? What helped you overcome them? Thank you so much for this tip. I'm loving this focus of yours on beautiful sewing. Ohh! Thanks for this tutorial! It looks so polished when it is finished! Ooh, this looks so precise and neat! Thanks for sharing your tips! Great tutorial! And very clear! I have something to add to it - when staystitching, I change my stitch length to VERY TINY 1/2" from either side of corner. It stabilizes/holds the fabric better and prevents it from fraying through the seam. Thank you. This is the clearest explanation of how to do corners I have seen! Thanks for adding this step! Exactly! Before I even started sewing I though that making a great garment required a lot of fancy techniques. It's true in a way, but mainly a good quality garment is all about basic simple steps!